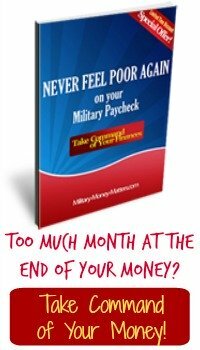 Welcome to our Military Families Blog Archives, where you'll find the blog entries that have previously appeared on the Military Families Blog at www.Military-Money-Matters.com. If you'd like to subscribe to receive our latest entries, either by e-mail or RSS feed, you'll find subscription information in the column just to the right. The perfect gift for that hard-to-shop-for guy on your list! Mysteries of the Blue Angels: How Do They Do That? takes you inside the cockpit with the flight leader of the world-famous U.S. Navy Blue Angels. Be one of the first to learn some never-before-revealed secrets of the Blue Angels! Former Blue Angel Boss Hoss Pearson gives you a rare peek behind the curtain to show you how the Blue Angels thrill millions, year after year, with their near-perfect precision aerial maneuvers. The aviation enthusiast will especially enjoy detailed descriptions of the maneuvers flown by the team, and of the modifications made to their aircraft. No shipping cost, or delivery worries. It's available for instant download, worldwide. All you have to do is e-mail the download code to your intended gift recipient. Each code is good for one download. Now through Christmas Day, you can receive $10 off the regular price of $29.99 by typing the discount code "Christmas" where indicated on the shopping cart page. Hurry! Order yours today for just $19.99! GUYS! Wanna be a hero? Send your wife, your mom, or your best girl 50 beautiful roses for Christmas, for only $59! The deadline is December 18, so click the link below to order today! These are beautiful long-stemmed roses grown in Ecuador, the world's second-largest exporter of roses. This offer has been arranged by personal friends of ours, so we can confidently vouch for the quality and value. One year I received 100 of these breathtaking roses for my birthday. Most roses go from Ecuador to Miami by air, are stored in Miami and then shipped by truck until they sit in a store. They can be a week or more old when you see them (especially if you buy them in a grocery store). The roses you receive from this offer are cut and stored overnight, driven by refrigerated truck to Quito airport and flown to Miami to a special refrigerated Fedex facility, then flown to your Fedex destination for immediate delivery. They can be in your hands only four days after being cut! They should last about two weeks if you follow the included care instructions. You're lucky if you can keep florist roses for one week. Our friends live in Ecuador half the year and have created a charitable foundation that owns a small hotel there. The proceeds from operation of the hotel are used to help the indigenous poor in the local town. They teach free English classes to the local children, and offer a free lending library of books in both Spanish and English. For each order, our friends are donating $20 to the Land of the Sun Foundation (LOTS), to help the local population. As of 15 December, 3500 roses have been purchased, generating $1400 for LOTS. LOTS recently held a Christmas party for local children, distributing $500 worth of much- appreciated Christmas gifts to local children who have very little in the way of material goods but are rich in love and joy. So your order of 50 roses makes two fantastic gifts, for just $59. Imagine the surprise of your wife, mother or girflfriend when she opens a FedEx package to find 50 premium roses, directly from the plantation where they were grown. This would be an awesome gift for anyone, but imagine how much more special it would be from a deployed service member. And thanks to the internet, you can order these roses even if you're stationed in Iraq, Afghanistan, or other far corners of the world. It's not often you can make such a fabulous double gift for $59. And they come with a money-back guarantee. Click below for details. Please share this with your friends ASAP (we apologize for the short lead time), and order yours today! And let them know we sent you -- there's nothing in it for us, we'd just like them to know you're one of our readers. If you do order them, please drop us a note and let us know how much they were enjoyed. We invite you to post holiday messages of support for our men and women in uniform. Let them know you remember and appreciate their service as you prepare to enjoy the holidays safely at home with your families. Tell them you appreciate them being far from their own families so that you can be with yours. We can never thank them enough for ensuring our continued freedom. I wonder how many (or how few) Americans who are not associated with the military in some way, or related to a WWII veteran, will even remember that this date marks a milestone in American history? The controversy over President-Elect Barack Obama's birth certificate continues. There is a new effort to force him to produce an authentic birth certificate for inspection before the electoral college votes on December 15, to prove that he, in fact, is eligible to be President, as a natural-born citizen of the United States. 1) Click on the link below and sign the petition at World Net Daily to demand Obama produce a legal birth certificate. 2) Fax the White House, which supposedly has said that they will respond to the legal birth certificate issue if they get 3500 faxes before Friday. (Obviously, there's no way to verify this.) Here is the fax number (yes, it's really a White House fax number - we did verify that): 202-456-2461. In your fax demand a response. You might also want to send a copy of your fax to the Republican National Committee, at 202-863-8820, and the Justice Department, Office of the Attorney General, at 202-307-6777. If anything is going to be done about this issue, it should be done before the electoral college votes. As we pause to count our blessings on this Thanksgiving holiday, we give thanks for the freedoms we enjoy as Americans. We are especially grateful for the selfless service of our men and women in uniform as they stand watch around the world today and every day, preserving our freedom to celebrate with our families. Their families, who don't raise their right hands to take an oath or wear a uniform, also serve, and we are grateful for their sacrifices that enable their loved ones to serve. We wish them all a safe and happy Thanksgiving. We pray for the safe return of those service members to their families at the successful completion of their mission. We'd like to share with you a beautiful Thanksgiving tribute, published by the Military Support Group of the Connection Pointe Christian Church of Brownsburg, Indiana. After you've watched it, and wiped the tears, please come back and click on the link below to post your own message of thanks to the troops on this Thanksgiving. A belated Happy Birthday to our Marine brethren. The U.S. Marine Corps celebrated its 233rd birthday on November 10. Semper Fi. "Ninety years ago today, the guns fell silent in Europe. World War I – the 'war to end all wars' – was over. Almost five million Americans served during that first modern, mechanized war. Our last living link with them, 107-year-old Army veteran Frank Buckles, observes this Veterans Day at his farm in West Virginia. "For now, we have a new president-elect. In the spirit of reaching across the aisle, we owe it to the Democrats to show their president the exact same kind of respect and loyalty that they have shown our recent Republican president." Kathy writes: Friends In the last 10 hours, two friends called me. One was ecstatic. The other very worried. One friend supported Barrack Obama. On my way to lunch recently, I passed a homeless guy with a sign that read "Vote Obama; I need the money." I laughed. In the restaurant, my server had on an "Obama 08" tie. Again I laughed. Just imagine the coincidence. When the bill came, I decided not to tip the server and explained to him that I was exploring the Barack-Obama-redistribution-of-wealth concept. He stood there in disbelief while I told him that I was going to redistribute his tip to someone who I deemed more in need — the homeless guy outside. The server angrily stormed from my sight. At the end of my rather unscientific redistribution experiment, I realized the homeless guy was grateful for the money he did not earn, but the waiter was pretty angry that I gave away the money he did earn even though the actual recipient "deserved" (or needed) money more. Ed. note: It's also a much easier concept to swallow when it's someone else's wealth you're planning to re-distribute! We want to remind you, however, that all charities are not created equal. Prioleau writes: Things Fall Apart Well, it's all over but the taxin'. The Chosen One has been chosen, and America is in for some big changes. In honor of Veterans' Day, bridal shops across the country are showing their appreciation of our troops by holding special bridal-gown giveaways for brides on active duty or brides whose grooms are on active duty in either Iraq or Afghanistan. To be eligible, you must be engaged, be on active duty in the military, or have a fiance on active duty in either Iraq or Afghanistan. All military brides must show proper ID, copy of deployment papers, orders or other qualifying proof. A certain number of dresses have been selected by each participating shop, and will be given away on a first-come, first-served basis. For a list of participating bridal shops and dates and times of their individual events, click on the link below. How many of you heard about the cost of Barack Obama's two trips to Hawaii, once for vacation in August (which caused him to refuse a request for a military townhall in Texas), and again last week to visit his ailing grandmother? Seems that those trips, in a private chartered 757, cost his campaign more than $400,000 EACH, for purely personal trips. He did no campaigning on either trip. Yet no one in the mainstream media mentioned his waste of more than five times the cost of Palin's wardrobe (which she won't even keep) for purely personal benefit. Surely you remember the flap about Sarah Palin's campaign wardrobe, for which the RNC allegedly paid $150,000? That was picked up by all the major news outlets. The New York Times ran it on page 1. The media lambasted the RNC for extravagance, and for wasting campaign contributions on such trivia. Yet none of them mentioned Obama's wasteful extravagance of more than five times that amount! And many people are trying to claim that there's been no media bias in this campaign. There's been a lot of talk lately about Obama's socialist ideas. In this multi-part series, Investor's Business Daily, takes a look at Barack Obama's Stealth Socialism. This is recently updated, so even if you've read it before, check to see if it's been updated since you were there. Here's your last chance to share your thoughts and opinions about the election! Tell us who you're voting for and why. And regardless of your choice, VOTE! Tomorrow, you have the privilege to vote for the next President of the United States. We know that as members of the military, you get why Obama's connection with confessed terrorist William Ayers matters. What we don't understand is why the rest of America doesn't get it. If you care about their connection, this may be of interest to you. Every American voter who is considering voting for Barack Obama should read this article, published in the Evening Standard in the UK, about Barack Obama and his promises. Obama visited Kenya with great fanfare after being elected a U.S. Senator, and became an instant folk hero. The village that was home to his father even renamed their school after the Senator. He made promises to help support the school, which was in serious need of basic upgrades, like running water. What happened to his promise to "spread the wealth" in his ancestral village? As of today, they're still waiting for that "support" he promised them. And if you vote for him, you'll be left wondering what happened to the promises he made to you. Here's a hint: Remember that tax plan that was going to cut taxes for anyone making less than $250,000 a year? Then it was $200,000. Then Joe Biden said $150,000. Today Bill Richardson said it was $120,000. And before they're done, you'll find that promise simply evaporated. Unless you've been living under a rock for the past year, you've surely heard of Barack Obama's radical connections with the likes of race-baiting, America-hating Reverend Jeremiah Wright and unrepentant terrorists William Ayers and Bernadine Dohrn, and probably Nation of Islam's Louis Farrakhan. This Harvard-educated lawyer, who fits the profile of an Obama supporter, explains why he's voting for John McCain. His reasoning makes good sense to us, and we think it will make good sense to you as well. As he explains, electing a President is essentially a hiring decision. If you were hiring a lawyer to represent you in a death penalty case where your life was on the line, which candidate would you hire? Our founding fathers were especially careful to create a government that had a system of checks and balances, so that no one branch of government had any more power than another, and each would keep an eye on attempted usurpation of power by the others. Should Barack Obama be elected President next week, we will have both the executive and legislative branches of our government controlled by liberal Democrats. And eventually the judicial branch as well, because the next president will likely appoint more than one new Supreme Court Justice. That leaves NO branch of government to keep the others in balance. It would leave our entire government controlled by liberal Democrats. That should cause a reason for concern, and we urge voters who are still undecided between the two candidates at this point to consider voting for the systems of checks and balances that has worked well for our country for more than 200 years. "I acknowledge, in the ordinary course of government, that the exposition of the laws and Constitution devolves upon the judicial. "But I beg to know upon what principle it can be contended that any one department draws from the Constitution greater powers than another in marking out the limits of the powers of the several departments." Subscribe to our RSS feed. Easy, anonymous.